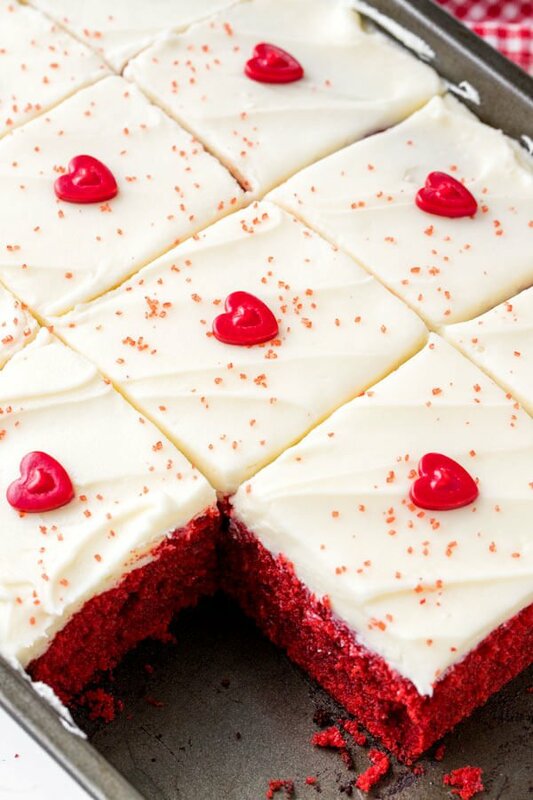 This easy red velvet cake is fluffy, moist, topped with cream cheese frosting, and has the most beautiful red color. 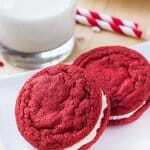 It has the perfect red velvet flavor that’s slightly tangy with a milk chocolate taste. Easy to make & oh so delicious – it’s the perfect red velvet cake recipe. Red velvet cake has been on my baking to-do list for a long time. 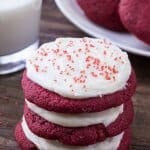 I wanted a red velvet cake recipe that’s moist with a soft cake crumb, the perfect red color, a delicious hint of cocoa, and the fluffiest cream cheese frosting. It’s a classic for good reason. As much as I absolutely love red velvet – I didn’t want the hassle of making a layer cake though. Sometimes I can’t handle the potential stress of toppling cake layers. And sometimes I need enough cake that can serve a small army. 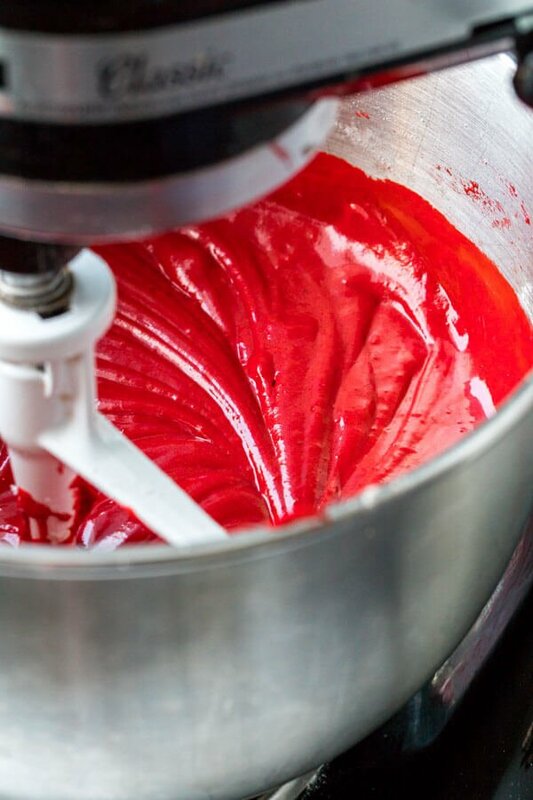 So for today’s easy red velvet cake recipe – we’re making a red velvet sheet cake. All the deliciousness with way less work. Ok – so now that I’ve admitted my aversion to layer cakes, let’s talk about this easy red velvet cake. Butter & oil. Butter adds flavor and oil makes the crumb extra moist. Cake flour. It gives the lightest, most delicate cake crumb. If you don’t have cake flour you can use a combination of cornstarch & all-purpose flour (see recipe notes), but I find cake flour works the best. Buttermilk. 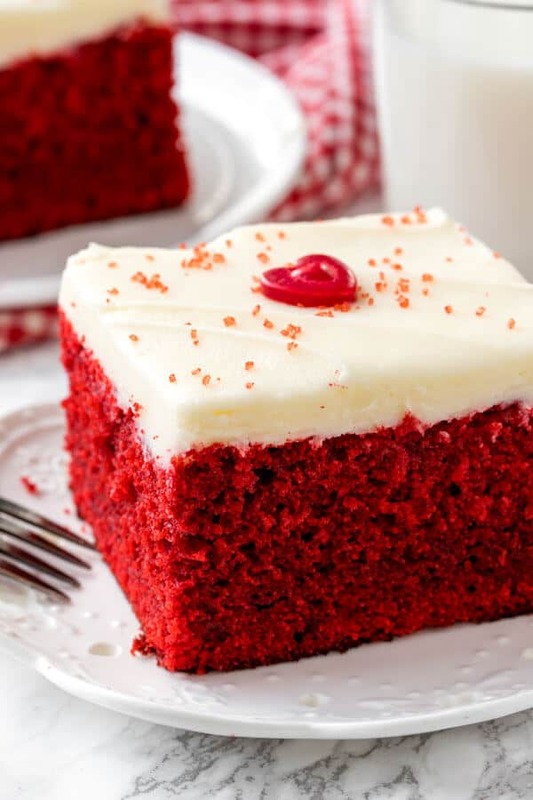 It creates a soft, deliciously moist cake that’s synonymous with red velvet. It also adds a slight tanginess to the flavor that’s key. Finally, vinegar. At the very end, we mix vinegar into the cake batter. Vinegar reacts with the baking soda to help the cake rise. 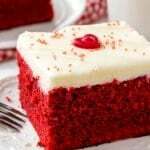 It also helps to bring out the red color of the cake when it reacts with the cocoa powder, and it adds just enough acidity to give the cake it’s classic red velvet flavor. Make sure your butter, eggs and buttermilk are at room temperature before getting started so you don’t have to over mix your cake batter. Over mixing cake batter can cause your cake to get tough and dry instead of moist and tender. 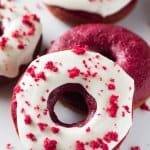 The amount of red food coloring you use in this recipe is a little up to you. For these photos I used 2 1/2 tablespoons for the perfect color. But you can play around with the amount if you prefer a little less or a little more. Gel or liquid food coloring will both work too. After the cake is done baking, it’s time for our cream cheese frosting. Seriously – could there be anything better? 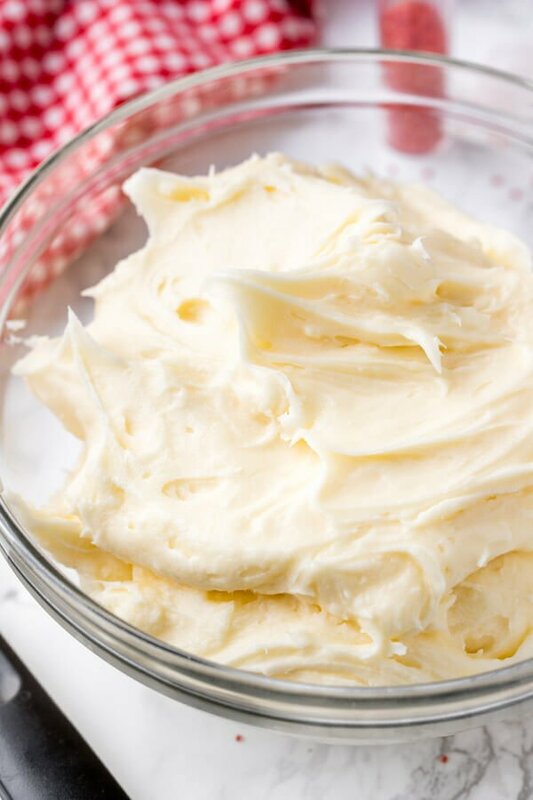 For today’s cream cheese frosting, you only need a few simple ingredients: butter, cream cheese, vanilla extract, salt, powdered sugar, and maybe a little whipping cream. Make sure you use full-fat brick cream cheese instead of lite cream cheese or spreadable. Both of those kinds of cream cheese are too thin for making frosting with. You can also play around a little with the amount of powdered sugar depending on how sweet you like it too. Then frost your cooled cake, and optionally decorate with sprinkles. If you want to learn even more tips about making cream cheese frosting – you can also check out my full guide to making it here. 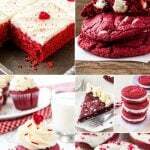 The red velvet cake can be made the day before. Cool fully, then cover and store at room temperature for up to 1 day. Then I recommend making the frosting the day you plan to serve the cake. Unfrosted cake can be frozen. Simply cool the cake after baking, wrap tightly and freeze. Then thaw overnight in the fridge, and forst it when you’re ready to serve. This easy red velvet cake has the perfect red velvet flavor, deliciously moist and tender cake crumb, and tangy cream cheese frosting. 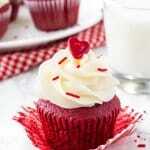 You’ll love how simple the recipe is – and will quickly become your favorite red velvet recipe. 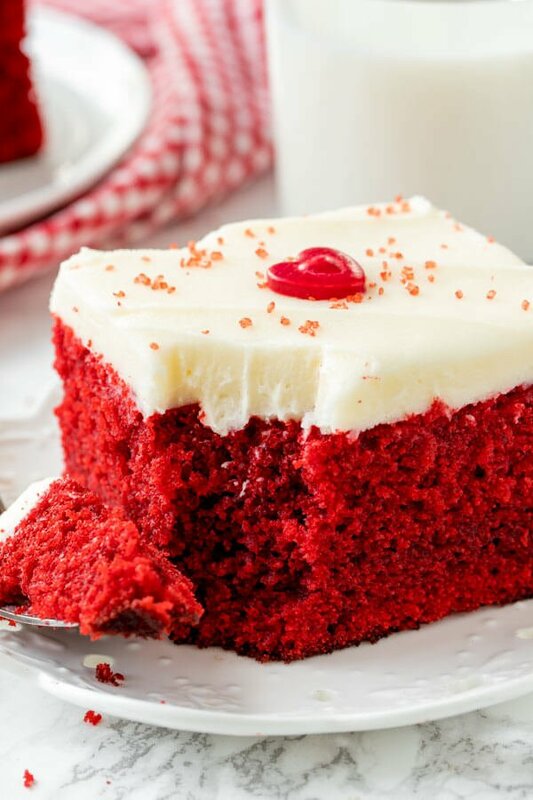 This easy red velvet cake is fluffy, moist, topped with cream cheese frosting, and has the most beautiful red color. It has the perfect red velvet flavor that's slightly tangy with a milk chocolate taste. Easy to make & oh so delicious - it's the perfect red velvet cake recipe. In a separate large bowl beat together the butter and sugar until fluffy. Beat in the oil, followed by the eggs, vanilla extract & red food coloring. Beat in the flour mixture into the butter mixture about 1/3 at a time, alternating with about 1/3 of the buttermilk. Turn off the mixer and scrape down the sides of the bowl as needed. Pour the batter into the prepared pan and bake for 30-35 minutes, or until an inserted toothpick comes out clean. In a large bowl beat the butter until soft. Add in the vanilla extract and salt. Mix in the powdered sugar about 1 cup at a time until the desired sweetness is reached. If the frosting seems too thick or sweet, mix in a little cream 1 tablespoon at a time. Frost the cooled cake, and optionally decorate with sprinkles. *If you don't have cake flour, measure 2 1/2 cups all-purpose flour. Remove 1/3 cup all-purpose flour, then add in 1/2 cornstarch. Sift the mixture together 3 times. ***Store frosted cake at room temperature covered for up to 8 hours, then store in the fridge. If the cake is in the fridge, take out of the fridge 30 minutes to 1 hour before serving to let the cake warm up to room temperature. There was no mention about the amount of vinegar. Please advise. Thank you so much for catching that error! 🙂 I’ve now updated the recipe – you’ll need 2 tsp of vinegar.